The Qualcomm Institute at UC San Diego and the San Diego Art Institute have formed an alliance to fuse cutting-edge technology with contemporary art in Balboa Park. 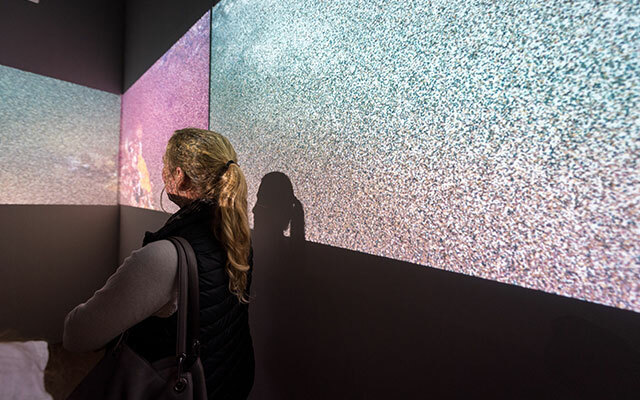 A memorandum of understanding calls for UC San Diego students to display their work at SDAI’s gallery in the House of Charm, and for local artists to collaborate with researchers to create new and original pieces using the latest technology. “We are thrilled to announce this exciting new partnership. It will not only enhance the experience of thousands of visitors to Balboa Park and SDAI, it will also encourage contemporary artists, students and scientists to tap into technology and to push artistic boundaries,” said Jacqueline Silverman, executive director of SDAI. “There’s no place more fitting to showcase the intersection of art and technology than in Balboa Park,” she added. The announcement comes as SDAI prepares for the opening on Nov. 30 of “Rising Tide,” an interactive visual and sound installation by San Diego-based artist and graduate student in computer music Jacob Sundstrom. The exhibition exemplifies the type of tech-enhanced experiences to be presented at SDAI under the new partnership. The Qualcomm Institute coordinates interdisciplinary research at the university in four areas of benefit to society: culture, energy, the environment, and health.